46.99 GBP Only 1 left In stock, ready to dispatch. 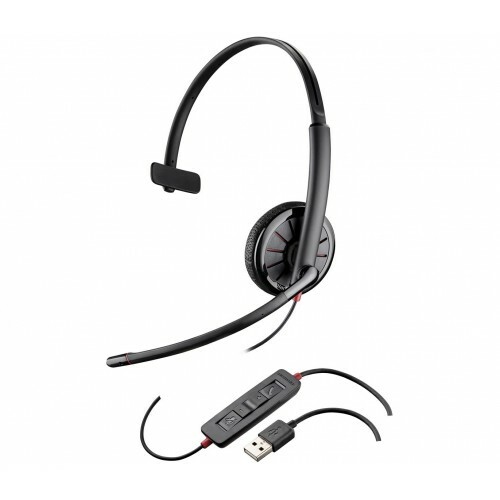 The Plantronics Blackwire C315-M is a mono, USB headset that’s completely plug and play via USB. With Plantronics Spokes software, the user is afforded full call control and the ability to customise all settings. It’s surprisingly stylish and comfortable, with sleek lines and a light leatherette ear cushion that won’t weigh down the wearer, plus it folds completely flat for transport within the carrying case that’s included. A wideband microphone with noise cancellation capabilities allows for clear calls on the C315-M. The microphone also has a Dynamic EQ feature to optimise voice quality for the best audio possible. The mono speaker is also of high quality, and is perfect for voice calls and for listening to music or other media. And, for times when it's best to listen and not speak, the mute function disables the microphone while keeping the speaker on. The Plantronics Blackwire C315-M is a sturdy, easy to use, and customisable headset that will get the job done for your team. It offers outstanding sound performance, especially for a mono headset. Companies and organisations who want a headset that’s both comfortable and great looking would do well to choose this product. Great Headset with usb connection. Answer and mute keys on the headset for easy access.